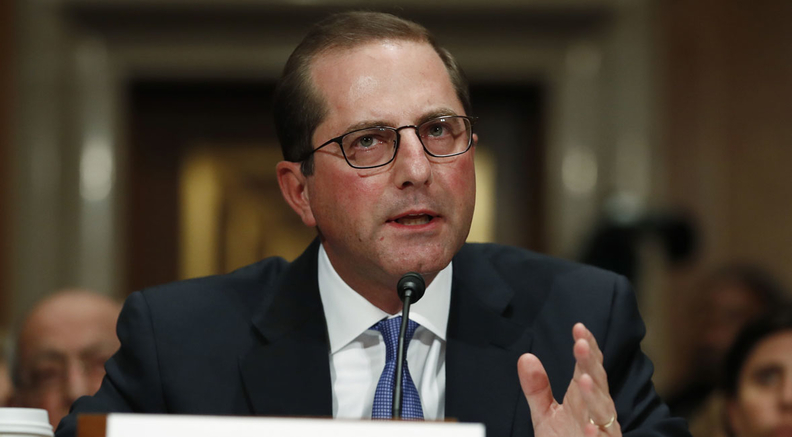 Two weeks into his new post, HHS Secretary Alex Azar on Wednesday took another step in the Trump administration's move toward relaxing the Affordable Care Act's moratorium on new physician-owned hospitals. In the HHS budget hearing before the House Ways and Means Committee, Rep. Sam Johnson (R-Texas) asked for Azar to commit the administration to help repeal the ACA's "ban" on physician-owned hospitals. Azar promised he would help change existing restrictions even if he stopped short of saying he would support a full repeal. The ACA provision effectively blocks new physician-owned hospitals from being established by barring them from Medicare. Existing physician-owned hospitals that want to expand into new facilities can request an exception from the HHS secretary if they meet certain requirements or have a high rate of Medicaid patients. "I commit to work with you on any changes we can make to make sure we are allowing good competition allowing physician-owned, or other-owned, facilities to compete and deliver the highest quality, low-cost care to our beneficiaries, so I'm very happy to work with you," Azar said. Johnson, whose north Texas district includes physician-owned hospital Victory Healthcare, has spoken out against the ACA's restrictions on physician-owned hospitals since the law passed. Texas is one of the rare states that doesn't require new hospitals to obtain permission to build new facilities, and it has the highest number of physician-owned systems in the country. The trade group Physician Hospitals of America counts 69 member hospitals in Texas, 10 of which are in Dallas and Dallas County, according to a spokesperson for the group. Last year, Johnson introduced a bill that would repeal the ACA restrictions. Sen. James Lankford (R-Okla.) introduced the companion bill in the upper chamber. Azar, in a question-and-answer with Johnson, said physician-owned hospitals would help foster "effective competition" for other hospitals. "It's my understanding that many physician-owned hospitals provide superb quality care, and we ought to be inspiring competition among providers," Azar said. Azar's remarks aren't the first sign that the Trump administration may be eyeing a change in the ACA restrictions. Last April, the CMS began soliciting comments on what role physician-owned hospitals should take in the overall health system as well as on which regulations should be rolled back. Hospital groups adamantly oppose any lifting of these restrictions, which they say would ultimately hurt patients and communities. In June of last year, two powerful hospital associations—the American Hospital Association and the Federation of American Hospitals—teamed up to write a letter to lawmakers to oppose the bill. "For more than 15 years, community hospitals, policymakers, the business community and governmental advisory bodies have grappled with overutilization and higher healthcare costs caused by self-referral to physician-owned hospitals," the letter stated. In their letter, hospitals also cited analysis from a healthcare consulting firm Dobson/DaVanzo comparing physician-owned hospitals to non-physician-owned hospitals. The analysis said physician-owned hospitals were more likely to reject Medicaid and uninsured patients and take on fewer medically complex cases. The all-payer margins were nearly three times those of non-physician-owned hospitals, the analysis said. Erik Rasmussen, vice president of legislative affairs for the AHA, doubled down on the group's opposition to policy change because he said the cherry-picking of healthier patients hurts other hospitals. "When physicians are allowed to self-refer patients, they tend to send the healthiest and wealthiest patients to their own facilities," Rasmussen said. "This cherry-picking of healthier, better-insured patients erodes the healthcare safety net, unfairly leaves other hospitals with higher costs, and can jeopardize access to critical services in many communities." Physician-owned hospitals, however, frame the moratorium in the context of diminishing competition amid a trend of provider consolidation. "Increasing hospital consolidation hurts patients through lower quality, increased costs and reduced access—essentially the opposite of the triple aim," John Richardson, executive director of Physician Hospitals of America, said in a statement. "While a lot of attention has been placed on health plan competition, very little has focused on providers." Richardson said his group "stands ready" to work with Azar to "restore competition to the hospital marketplace. "The moratorium on physician-owned hospitals should be lifted, so that more patients are able to benefit from the higher quality, lower cost healthcare these physician-led facilities provide to their local communities," Richardson said. In a separate Wednesday hearing by the House Energy and Commerce oversight subcommittee that looked at the impact of consolidation on healthcare prices, another Texas lawmaker raised the issue of the moratorium as well.